Comprised of documents created since the 1970s, the 2.6 terabytes of data (known as the Panama Papers) shine light on 214,000 anonymous offshore companies located around the world, often setup to hide their owners’ identities and business dealings. “The data provides rare insights into a world that can only exist in the shadows. It proves how a global industry led by major banks, legal firms, and asset management companies secretly manages the estates of the world’s rich and famous: from politicians, Fifa officials, fraudsters and drug smugglers, to celebrities and professional athletes,” SZ writes. One of the individuals now mired in controversy is Prime Minister of Iceland Sigmundur Davíð Gunnlaugsson. Leaks from the Panama Papers show that the 41-year-old and now wife Anna Sigurlaug Pálsdóttir owned an offshore that held millions of dollars in bonds during the country’s financial crisis. According to The Guardian, the papers show that Gunnlaugsson co-owned a company called Wintris Inc, set up in 2007 in the British Virgin Islands to handle investments with his partner. Gunnlaugsson is said to have owned a 50% stake in Wintris for more than two years, which was later transferred to his wife who held the other 50%. However, while Gunnlaugsson was still a Wintris shareholder he was elected to parliament as leader of the Progressive Party. He never declared his Wintris shares on Iceland’s register of MPs’ financial interests as required. Yesterday Gunnlaugsson walked out of an extremely awkward interview (below) and is now facing calls to hold a snap general election. If an election does in indeed go ahead, Icelandic politics will be on a knife edge. 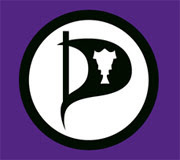 Last Friday Gallup published the results of its latest poll and it shows that the leading political force in Iceland is the Pirate Party. 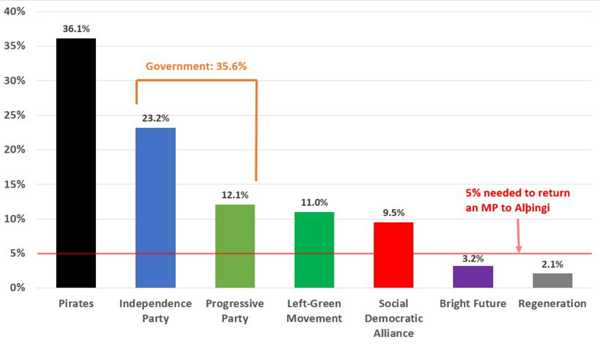 As the chart clearly shows, not only is the Pirate Party way ahead of its nearest rival, but it’s also polling just ahead of the combined Independence Party/Progressive Party coalition government – and this was the position before the Panama leaks controversy. For a country that relies on coalition governments this is a pretty big deal and for the local Pirate Party the achievement is nothing less than astonishing. In 2013 (and after just a few months of existence) the party achieved 5.1% of the vote and entered national government with three Members of Parliament. It is now looking at the possibility of a much bigger prize with Pirate MP and spokesperson Birgitta Jónsdóttir noting that the party is prepared. “In these strange times anything is possible,” she says. Jónsdóttir says she feels that Sigmundur Davíð Gunnlaugsson won’t step down and during a live TV broadcast yesterday he confirmed as much, stating that the Panama Papers contained “nothing new” about his and his wife’s business affairs. Nevertheless, this storm is far from over. With the revelation that the Prime Minister’s finance minister and interior minister also had stakes in offshore companies, thousands of people protested outside Iceland’s Parliament last evening calling for the government to step down. Only time will tell how this situation will play out, but the prospect of a Pirate-led coalition government is both intriguing and unprecedented.